The Sneaky Snowman is about to tiptoe into the Fortnite loot pool. It was just officially announced via the in-game news feed, which means it’s safe to expect the item to hit the game tomorrow as per Epic’s usual announcement and release cadence. We don’t yet know exactly how the item will work, but by all appearances it looks like this is Epic’s new take on the Bush. 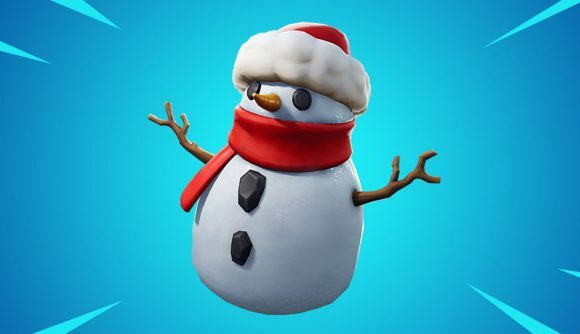 Sneaky Snowman’s official description reads “become a master of disguise.” While we’ve had our fun with bush camping in the past, the Bush item itself – which acts as a consumable that disguises you as a mobile plant – has fallen well out of the meta. As Fortnite Intel notes, Epic has discussed some plans to bring the Bush back into favour, and our new snow buddy might be the answer. We’ll see how many – if any – of those potential Bush changes end up affecting the Sneaky Snowman soon. Even though we’re past the holidays, Fortnite’s winter-themed events have been continuing, and the Ice Storm event has brought us a frozen new set of AI enemies to contend with. Check out our Ice Storm challenges guide if you’re looking for detail on the tasks that have come alongside those ice monsters. In broader news, Fortnite annual revenue for 2018 set a new record, as we learned last week. $2.4 billion for the year means that Fortnite has now had the most profitable year of any title in gaming history.